I posted a general overview of Shinkansen trains in Japan in the general "The Ready Track" forum. Here I will post about N-scale models. Japan has two large model companies that make N-scale trains, and 2 smaller companies that also compete in the area. There may be smaller specialty ones as well, but these 4 make up the major n-scale manufacturers in Japan. Tomix (Tomytech -- the TOMY company) and KATO are the major players. KATO of course also is a major player for US model trains and is also a player in Europe (where there stuff is sold by Lemke and NOCH for European trains, mostly HST (Lemke) or Swiss trains (NOCH), and also imported by European shops for the Japanese and US stuff). Tomix is mainly Japan only in terms of model trains (but TOMY is a major toy company worldwide). Greenmax and Micro Ace are the two smaller players. I don't know if Greenmax has done Shinkansen, but Micro Ace has done some Shinkansen. Being smaller, they tend to make models of smaller lines, or of variants not done by the majors. For example, Micro Ace makes the JR East inspection train Shinkansen, which Tomix and KATO don't (while KATO does make the JR Central inspection train Dr Yellow). Both Tomix and KATO typically will make versions of the same trains. You can get an N700A from both, or an E5 from both. Both manufacturers make good models and have characteristics that make them unique (and in their fans' eyes, better). Tomix Shinkansen (but not their non-Shinkansen models in most cases), have all-train power pickup -- the wagons share power throughout the train to help avoid drop outs from dirty track etc -- when you have 8, 12, or even 16 cars all picking up power, they are unlikely to all suffer a dropout at the same time). KATO is usually DCC friendly (but not all of them are). There are other differences as well between them, both pro and con. (Tomix does not know the word DCC, though I have upgraded Tomix Shinkansen with wired decoders and HOW-TO will be eventually on my blog). The first picture I would like to post is of my 500 series trains. The Shinkansen 500 series were made by JR West and first used as Nozomi trains. They were at one time the fastest Shinkansen. They did however have some weaknesses which lead to their being demoted early in their life. They are still used today in Kodama service and in special liveries as well (as Kodama). One shortcoming is that while fast on the straight track, they had to slow down more to go through curves than other Shinkansen. Also, having a round, circular cross section, they were not as spacious inside. I own 3 different Shinkansen 500 models (technically I own two, and my daughter one). 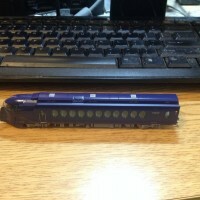 I have a KATO Nozomi Shinkansen 500, but only 8 cars worth. Nozomi run as 16 car trains. The Kodama version of the 500 is an 8 car train, so I call mine a Kodama , but I think that the Kodama trains have been reorganized so that the actual 8 cars I have would not match the 8 cars run. But normal folks would not see the difference. It is gray with blue. I also have the KATO Neon Genesis Evangelion (EVA) special livery 500, which ran as a Kodama from Nov 2015 through May 2018. I regret that I did not get a chance to ride this train in real life, despite being there in both Dec 2015 and 2017. I did not, at the time, know of its existence. The KATO version of the EVA 500 is not prototypically correct, as I understand it, as they just repainted Nozomi cars or something. Technically the Tomix version is supposed to be more prototypical. My daughter owns the Tomix Hello Kitty Shinkansen 500 (Kodama). JR West took the EVA Shinkansen, after it was withdrawn, and re-painted it in a fun Hello Kitty livery and ran it for a few months in Kodama service. Both the EVA and Hello Kitty trains also had special exhibits, and other bits inside the train for the riders to experience. WPZephyrFan and MK like this. Is the Hello Kitty version based on a prototype? It's quite bright! Here are a few more Shinkansen (and a German ICE3 for comparison). The first pic is a Tomix E3 Yamagata Shinkansen "Tsubasa" (Treasureland Tohoku-Japan). This is a seven car Shinkansen run by JR East. The next image shows the same Tomix E3 with a Minitrix ICE3 on the track next to it, as a comparison. The last shot shows a KATO W7 Shinkansen (JR West -- the E7 is the same train run by JR East), again with the Minitrix ICE3 as a comparison. Another fan of Japanese rail except I run the Bandai stuff. The Japanese have some colorful trains and the luxury on most of them put our rail system to shame. Here is a video of one of the Hello Kitties running. John, thanks, that was awesome. Some general observations for those interested in what they saw (besides the Kitty-Chan 500). A little after the 4 minute mark you saw in the background a JR West Rail Star 700. The 700 preceded the N700 and at one time was the main Shinkansen for Nozomi service, as well as the middle service. JR West ran the 700 as the Rail Star (or Hikari Rail Star). Instead of 2+3 seating, it ran 2+2 (for reserved seats), and was overall a nicer interior compared to the JR Central 700 trains. JR West still uses it for special runs, and as needed. A bit later in the movie there was a section where you kept seeing white Shinkansen with blue stripes pass by. That is the N700 (better: N700A) train of JR Central on the Nozomi run. The only JR Central Shinkansen that I am aware of that run in JR West territory are Nozomi class that run mostly from Tokyo all the way to Hakata station on the very south western tip of Honshu, the main island. Otherwise JR West runs their Shinkansen (mostly their version of the N700 in cooperation with JR Kysuhu, which runs them on Kyushu, continuing on Honshu in JR West territory). Those Nozomi trains from JR Central are 16 cars long. You can see how long that is as the train goes by wicked fast. (About 442 yards long for a complete 16 car set). In models, only Tomix makes the Hello Kitty 500 but both KATO and Tomix make regular 500 series, 700 series, and N700 series of various sorts. You don't have to buy the complete 16 car set either. Usually you can buy a 4 car basic set, and then add-on sets to get to the full 16 cars. (Or other combinations to get there). A full 16 car set is between 8 and 8.5 feet long in 1/160. Onizukachan and WPZephyrFan like this. I have a small collection of Shinkansen. One somewhat sad thing is that the Shinkansen have basically replaced the loco-hauled passenger train (except special excursion trains). I think the last passenger trains with locomotives were discontinued in 2016, which were overnight trains. There are still regional EMU express trains and the long distance Sunrise Express pair (which are EMUs and the last overnight trains with sleeping berths). But traditional passeger wagons with locomotive traction are basically history in Japan, except in excursion and cruise train form. I'll (eventually) start a thread for Japanese passenger trains (locomotive hauled) as there is/was a rich offering of n-scale models covering these, including the ones shown above. The left most appears to be a 0 Series Shinkansen (original Shinkansen model), the middle a 500 Series, and the right most either a W7 or an E7 that runs on the Hokuriku Shinkansen line. Very nice lineup! They must wash the prototypes every night as I don't see a single bug splat! Drive my car on the highway at 60 MPH for an hour on a warm Summer night and the front bumper is covered! Trying to figure out what I just saw on the video but my mind is still reeling from all the pink. Is the hello kitty train set used in regular passenger service, or are they special runs for hello kitty fans? Also why are the warning signs in English? Do they get a lot of international tourists on these? Yes and they also do the train announcements in multiple languages on every train and station not just the bullet trains. A number of trains are special painted not just the bullet trains and they have several sets of bullet trains in all yellow called Doctor Yellow just just to monitor the rails packed with instruments. WPZephyrFan, chadbag and Kez like this. OK, I had dreams of pink rat things last night but I think my head has cleared and I'm over the PPSD. So its all an ad for Hello Kitty paid for by Sanrio. It's so... thorough? In your face? Shameless? Must have cost well north of a million bucks just to execute the conversion; Sanrio must be rolling in dough. The Hello Kitty Shinkansen runs regular Kodama service. But I would guess a lot of riders are there for the ride, not just to get somewhere. While I would be sure Sanrio paid a lot for it, I don’t think the purpose is only as an ad for Hello Kitty / Sanrio. I think JR West is also trying to pull extra ridership — lots of kids would want to ride it and have to bring their parents. Shinkansen tickets are not inexpensive. Japan has a history of special liveries around their anime cartoon characters and similar themes. There is a Haruka train in Osaka currently running AFAIK with Hello Kitty (Haruka is the Airport Express in Osaka) as well as another Hello Kitty themed train near Tokyo IIRC. Gudetama, Sumikko Gurashi, Anpanman, Rilakuma, and many others have been featured in special liveries in recent times. As has also been mentioned, signs and announcements in trains are usually in Japanese and English and increasingly in Chinese and Korean. It is also pretty common to have safety signs, In/Out/Push/Pull and similar signs in English in addition to and sometimes instead of Japanese at stores, public buildings, etc. It is an interesting place to visit, that’s for sure. I would recommend it to anyone looking for something different to do for vacation. For the rail fan it has a lot to offer. And you don’t need to speak Japanese to get around. I don’t and often go off with the kids by myself. MK and WPZephyrFan like this. Japanese rail is interesting and varied plus super efficient and colorful. I have watched a lot of Japanese rail videos on YouTube. The freight is interesting and operations run behind big electrics and diesel. Freight trains there run at passenger train speeds normally and in the mountain areas there are pusher operations. A lot of container traffic runs on Japanese rails and a lot of it is the smaller 14 to 20 foot containers. Their tank cars are different in design along with their hopper cars. Snow fighting operations are most interesting and the have varied equipment, most of it being double ended and self propelled. Some have a rotary at one end and a plow at the other while other are double ended rotaries. Their M of W equipment is absolute state of the art. I have some of the Bandai cars which are shorter versions of their stuff. I run the DD-51s in my roster and have the mini cab cars for mini RDCs for passenger. I have a small collection of their tank cars and the container cars with the small containers on my layout mixed with American prototype. I believe that Sapporro has a history of painting it's trams in Miku Hatsune (called "Yuki Miku" or "Snow Miku") every year. There's also the K-On! anime train in Japan.